Partnered with The New Center for Research and Practice, New York, USA, and the Baltic Centre for Contemporary Art, Gateshead, UK. 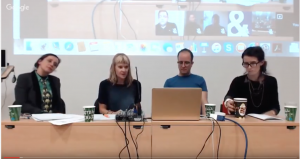 Part Two – Pete Wolfendale, Simon O’Sullivan, Ida Soulard, respondent Mo Salemy, chair Ian Ground. If art is not understood as the site of the irrational, unknowable or the ineffable then what forms of reason does it manifest? And how are these specific to artistic production and artistic methods? If art is to think critically, then can its critique move beyond what has become a determinate paradigm for a conceptual (thinking) practice, that is the self-conscious critique of its own nature? Art and Reason: How Art Thinks Part 1 of a series of two panel discussions.